These are what all the best-dressed gals are wearing in Iowa this week. Ooooooooohhhh ..... those are HAWT! 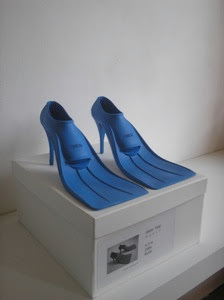 After reading your last post, these shoes aren't as funny as they would be useful. Glad to hear you're pitching in to help. Sandbagging can't be fun. Great work you are doing for this. Keep it up. Your work is really appriciable. May I help you in any mean?